It's rare for the leader of a country to die in office. Since 2008, it's happened 13 times worldwide - but 10 of those leaders have been African. Why is it so much more common in this one continent? Large crowds carrying candles ran alongside the hearse carrying the body of Meles Zenawi, as it made its way through Addis Ababa, on Tuesday. He had died, aged 57, after a long illness. Earlier in the month, tens of thousands of Ghanaians attended the funeral of their late President, John Atta Mills, who had died suddenly at the age of 68. Four months earlier, a national holiday was declared in Malawi to allow as many people as possible to attend the funeral of the late president, Bingu wa Mutharika, who had died of a cardiac arrest, aged 78. And in January, the president of Guinea Bissau, Malam Bacai Sanha, died in a military hospital in Paris after a long illness. He was 64. So, four African leaders have died in office this year alone. Disruptive for the countries concerned, tragic for the leaders' families. But spare a thought also for the reporters. "I seem to be getting an awful lot of calls in the night telling me an African president has died," says Simon Allison, a correspondent for South Africa's Daily Maverick website. "Why do African presidents keep dying?" The question led him to take a close look at their survival rate. "Go back just a little bit further and the list of dead sitting African presidents gets alarmingly longer," he says. Indeed, since 2008, 10 African leaders have died in office. 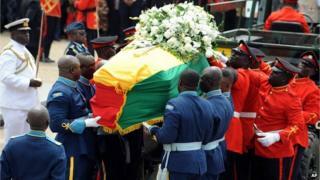 It's certainly true that leaders are dying in office in higher numbers in Africa than on any other continent. In the same period, only three other national leaders have died in office - Kim Jong Il of North Korea, Polish President Lech Kaczynski, who died in a plane crash, and David Thomson of Barbados, who had cancer. The obvious answer is that African leaders are just older than those of other continents, an explanation Simon Allison favours. He believes Africans like their leaders to be older - respect for elders is embedded in the culture of many of the continent's countries. Actually, the average age of African leaders is 61 years - the same as in Asia. European leaders are, on average, 55 years old, while in South America, it's 59. But another thing to consider is life expectancy which, among the general population, is lower in Africa than in Europe, Latin America and Asia. This is partly because of problems like the prevalence of HIV/Aids and also poor medical care, which leads to high rates of death in childbirth. But poverty in childhood and early life can also have a lasting impact, as Dr George Leeson, a gerontologist from the University of Oxford, explains. "African presidents, before they have been elected, will have led a relatively disadvantaged life, and disadvantageous lifestyle, and that will impact on their life expectancies at subsequent ages," he says. "So once they get into the presidential office, even though they will be living a lifestyle far far far removed from their fellow citizens, which would increase their life expectancy in relation to those fellow citizens, they do have an accumulated disadvantageous lifestyle which they have to pay back on at some time." Although of course, not all African leaders will have had poor childhoods. But is there another factor to take into account - politics? The stereotypical African leader clings on to power until he drops. But the facts don't seem to fit that explanation. "This is true of some of the leaders who died in office, particularly Omar Bongo, Conte and Gaddafi," says Simon Allison. "All of them were old-school dictators who were never going to leave voluntarily, but the others are different - Meles Zenawi had clung on to power for a long time, but he was only 57. And all the others were in their constitutional time limits and hadn't even fiddled with them yet." It's important to note that, our calculations only take into account the deaths in office of world leaders since 2008. It could be that the number of African deaths in this timeframe is just a statistical blip. But whatever's going on, such a death toll creates uncertainty. Deaths in office create power vacuums, which can be dangerous and destabilising. "Look at what happened in Guinea-Bissau," says Simon Allison. "When Sanha died, a coup followed very shortly afterwards. This is a difficult situation for Africa to find itself in because it, historically, has not done very well with power vacuums." However, he believes there is some cause for optimism. "In Zambia, in Malawi and Ghana and in Nigeria, the death of the president was followed by a constitutional succession with a minimum of violence and dispute, and I think this is a very encouraging sign for Africa's development."